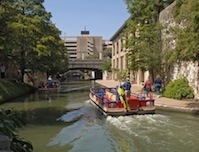 The fast growing city of San Antonio hosts over 100,000 students in 31 higher education facilities, including branches of Texas A&M and the University of Texas. Located near the center of Texas, this city of over 1.3 million has a warm climate. It is famous for its Paseo del Rio (River Walk) Tejano culture, and for being home to the SeaWorld and Six Flags Fiesta Texas theme parks. The city is visited by 20 million tourists per year. The Alamo (Battle of 1836) is a shrine and museum located in the heart of downtown, and is surrounded by many hotels and tourist attractions. There are many festivals held throughout the year. San Antonio has a strong military presence—it is home to Fort Sam Houston, Lackland Air Force Base, Randolph Air Force Base, and Brooks City-Base. The cultural scene is very rich with many theatres and museums. Tourism’s prevalence makes getting a part time job easy. Photo of the Alamo courtesy of Wikipedia and Sasukekun22. The city has a number of very different areas including the downtown, suburbs, and smaller towns that have been overrun by the city. Active adults coming here will want to spend some time either as a tourist or a renter to get the lay of the land. The Far North Central area has many upscale master-planned communities. Active adults in retirement will find every kind of housing choice – from dedicated retirement communities to all types of housing in the city’s neighborhoods. From apartments to condos to houses, the area offers a wide variety of choices and prices. According to the National Association of Realtors, the median home price was $229,100 during the 4th quarter of 2018, in the San Antonio and New Braunfels area. San Antonio has a vibrant art community that reflects the rich history and culture of the area. San Antonio is home to the first museum of Modern Art in Texas—the Marion Koogler McNay Art Museum. The Alameda Theatre is the performing arts component of the National Center for Latino Arts and Culture. The Lila Cockrell Theatre is a major venue for the performing arts. The San Antonio Symphony performs at the Majestic Theatre. The Charline McCombs Empire Theatre, Art Pace San Antonio, the Blue Star Contemporary Art Center, San Antonio Museum of Art, and the Guadalupe Cultural Arts Center. As one might expect in a city of over 1 million people, the crime rate is above average in San Antonio. As is befitting a progressive city there are more than a dozen hospitals here. San Antonio is home to the South Texas Medical Center, the largest medical research and care provider in the South Texas region.